Chrissi Island. Spend the day lounging on the white sandy beach. 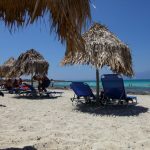 Chrissi (Golden) or (Donkey Island) is an uninhabited island about 12 km off the coast of the town of Ierapetra. It is five km long and on average one km wide. 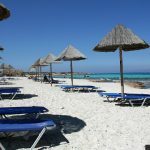 The island is renowned for its white beaches, sand dunes and forest of pines and junipers and is popular with tourists visiting for a day of sunbathing away from the crowds. 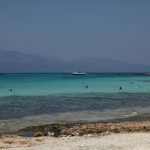 The western tip of Chrissi island has some remains of past settlement: a few Minoan ruins and a 13th century chapel dedicated to Agios Nikolaos (Saint Nicholas). It was inhabited into Byzantine times. The main sources of wealth were fishing, salt export, and the export of porfira (Tyrian purple) After the Byzantine period the island was abandoned, although later it was used as a hideout. The island of Chrissi is protected as an “area of intense natural beauty”. Especially in summer, the island attracts many tourists. As camping is forbidden on the island, only day trips are possible. 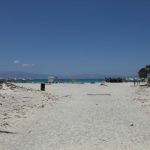 You can get a boat trip to Chrissi Island at around 10:30am and 12:30pm daily from the small port of Ierapetra. One of the foremost companies offering the boat trips are Union Cruise Vessels. The boat usually returns at 17:00 and 18:00 hours daily. Visitors are not allowed to roam freely over the island, but only on designated paths and some beaches close to the eastern tip of the island. There is a small tavern at the ferry landing. The waters around Chrissi island are quite shallow and perfect for snorkelling, you will see many different species of fish within its cool waters, there are many different types of shellfish to see, but its recommended not to take any from the island. If you want to go fishing on the island, then its certainly worthwhile but don’t expect to catch anything big, there are shoals of sea bream and mullet that swim these waters, and the best way to catch them is with bread flake. If you can return the fish to the sea after catching rather than taking home to cook its much appreciated. 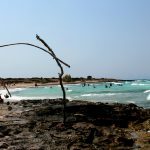 For more on fishing in Crete check out our Fishing in Crete Guide on our Crete outdoors page.